Died on March 29, 2000, in San Antonio, Texas. He was born August 18, 1903 in Marshall, Missouri. A member of the Class of 1927, Missouri Valley College. In 1952 the college honored him as a distinguished graduate with the Merit Award in Military Science. He earned his wings at Kelly Field on October 20, 1928. He was a member of the very first Army Air Corps Aerobatic team ''The 3 Yellow Jackets,'' whose flights were covered by national film media. In the following years, he became a command pilot and received the Air Medal ''for meritorious achievement... in sustained operational flight missions in the Southwest Pacific Area, during which hostile contact was probable and expected.'' He received the Legion of Merit ''for exceptionally meritorious conduct in the performance of outstanding services in the Netherland's Indies and the Philippine Islands...he planned the Leyte and Mindoro operations and the reduction of enemy air and naval strikes...in Luzon.'' He also received the Distinguished Service Medal and numerous other medals and commendations. General Morgan was a member of the Daedalians, QBs and the OX5. Prior to World War II, he was an Army Airmail Pilot, a flight instructor at Kelly Field, and Intelligence Officer in the Philippines and a Test Pilot at Wright Field, OH. After the war, he taught briefly at the War College in Washington, DC. He moved on to a variety of command assignments at Wright Field, Hill AFB, Hamilton AFB, Western Air Procurement in Los Angeles, J4 EuCom in Frankfurt and Paris, and the Air Force Cambridge Research Laboratories in Bedford, Massachusetts. Soon after retirement in 1958, he became Vice President of Beech Aircraft Corp in Wichita, KS. In the mid 1960s. General and Mrs. Morgan moved back to San Antonio where they enjoyed an active retirement. He was a Mason and a Shriner. He had been a member of the country club in Brookline, Massachusetts and the Bohemian Club in California. Survivors include his wife, the former Leroy Denman Browne; daughter, Michelee M. Cabot, Princeton, MA; two grandsons, Gilbert T. Stair, San Antonio, Texas, and W. Morgan Stair, Burlington, Massachusetts; and great-grandchildren. 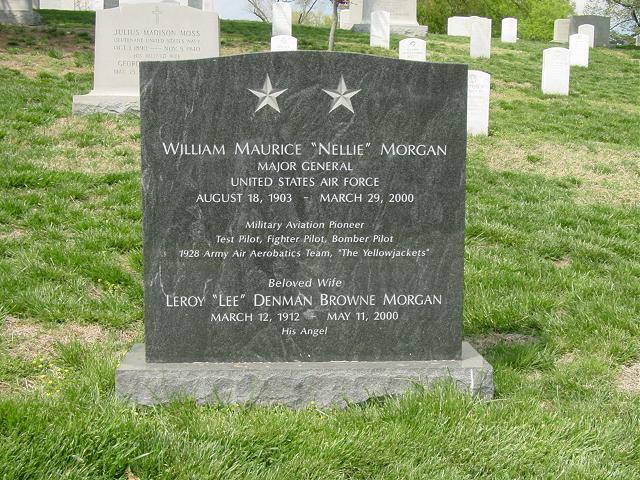 Interment Arlington National Cemetery with full Military Honors on April 11, at 9 a.m.
William Maurice Morgan vas born at Marshall, Missouri, in 1903. He enlisted as a flying cadet in October 1927, entered the Air Corps Primary Flying School at March Field, California, graduated from Air Corps Advanced Flying School at Kelly Field, Texas, Oct. 20, 1928, was appointed a second lieutenant in the Air Reserve and ordered to active duty with the First Pursuit Group at Selfridge Field, Michigan. Receiving his regular commission as a second lieutenant in the Army Air Corps in May 1929, General Morgan was transferred in June 1931 to the Air Corps Advanced Flying School at Kelly Field, Texas to become assistant commandant of cadets and fighter flying instructor. as assistant operations officer, test pilot of experimental aircraft, project officer on transport and training type aircraft, chief of the Production Engineering Section and assistant chief of the Production Division. During World War II General Morgan was transferred to the Pacific Theater in August 1944 as assistant chief of staff for operations of the Fifth Air Force. Assuming command of the 310th Bomb Wing of the Fifth Air Force in June 1945, a year later he was named commander of the 85th Fighter Wing of the 13th Air Force in the South Pacific. Materiel Area, with Headquarters at Hill Air Force Base, Utah. Joining the Air Defense Command in December 1949, General Morgan was designated vice commander of the Western Air Defense Force of Continental Air Command, with station at Hamilton Air Force Base, California. moving to Paris, France May 3, 1954. Returning to the United States June 22, 1956, General Morgan joined the Air Force Cambridge Research Center, Air Research & Development Command, at Cambridge, Massachusetts, and on July 21, 1956 assumed command of the center.